Shaikh A*, Mayadeo MN**, Warke HS***. Endometriosis is defined as presence of endometrium like stroma and glands outside the uterine cavity. There are many causes of scar endometriosis. A common theory is the direct implantation of endometrial tissue in surgical scars. Here we present a case of a 30 year old female presenting with scar endometriosis after 3 years of tubal ligation. Endometriosis is defined as presence of endometrial-like stroma and glands outside the uterine cavity. The name ‘endometriosis’ was given by Rokitansky in 1860. It is a rare entity. It is reported in 0.03-1.08 % of the women following obstetric or gynecological surgeries. Post salpingectomy endometriosis is documented in 20-50% of the tubes which are examined after ligation. It occurs in 8-15 % of the women of the reproductive age group. It usually occurs in region such as abdominal wall, ovaries, cul de sac, uterine ligaments, pelvic peritoneum, bowel and rectovaginal septum. It can also be present in unusual places like CNS, thorax, urinary tract, gastrointestinal tract and in cutaneous tissues. There are many causes of scar endometriosis. A common theory is the direct implantation of endometrial tissue in scars during the operation which commonly follows obstetric and gynecology surgeries. 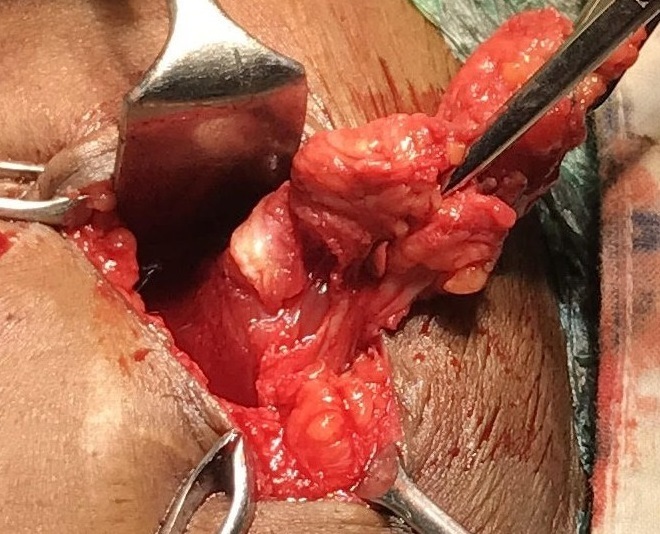 A 30 year old G4P3L3MTP1 with mini laparotomy tubal ligation done 3 years back at a tertiary medical care center came to the outpatient department with chief complaints of cyclical pain at tubectomy scar site since 2 years. She also had complaints of bloating sensation during menses. She did not have any previous history of endometriosis. Her general examination was normal. On local examination there was presence of 4 x 3 cm size nodule at the tubectomy scar site. The nodule was tender and immobile. Fine needle aspiration cytology (FNAC) showed presence of endometriosis. Ultrasonography (USG) of the abdominal wall was suggestive of 4 x 3 cm size scar granuloma with no abnormalities of the uterus and ovaries. Small vertical incision was taken over the nodule of about 3 cm in size. There was presence of fibrous tissue which was excised by sharp dissection and sent for histopathology. Post-operative stay in the ward was uneventful and she was discharged on day 5 of the procedure. Histopathology examination of the tissue showed fibrous tissue with few scattered endometrial glands and endometrial stroma. Scar endometriosis usually follows previous abdominal surgery including hysterectomy (10 %), cesarean section (16 %) and tubal ligation(3.3 %). During minilaparotomy tubal ligation, endometrial tissue might be seeded into the wound and under hormonal influence these cells proliferate. Post salpingectomy endometriosis is usually noted at the tip of the stump, 1-4 years after a tubal ligation. The chances of endometriosis detection are higher if electrocautery has been used in tubectomy, if the proximal stump is short and the post ligation interval is long. Care for its judicious use can be taken to avoid this complication. 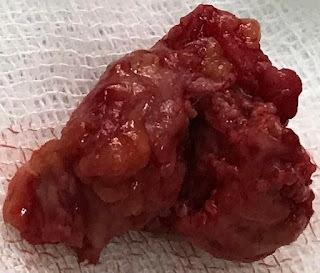 The differential diagnosis includes hernia, hematoma, suture granuloma, lipoma, abscess, sebaceous cysts, neoplastic tissue and metastatic carcinoma. The etiology is said to be the direct implantation of endometrial tissue. Under hormonal influence these cells may proliferate or the surrounding tissue may undergo metaplasia which leads to scar endometriosis. The time interval between the surgery and the presentation of scar endometriosis may differ from 3 months to 10 years. Ultrasonography is the most common imaging modality used to detect endometriosis. CT scan or MRI may also be used for deep pelvic endometriosis. FNAC aids in accurate diagnosis especially in enlarged masses. Histology confirms the diagnosis of scar endometriosis. There is presence of endometrial glands, stroma and hemosiderin pigments on histopathology. 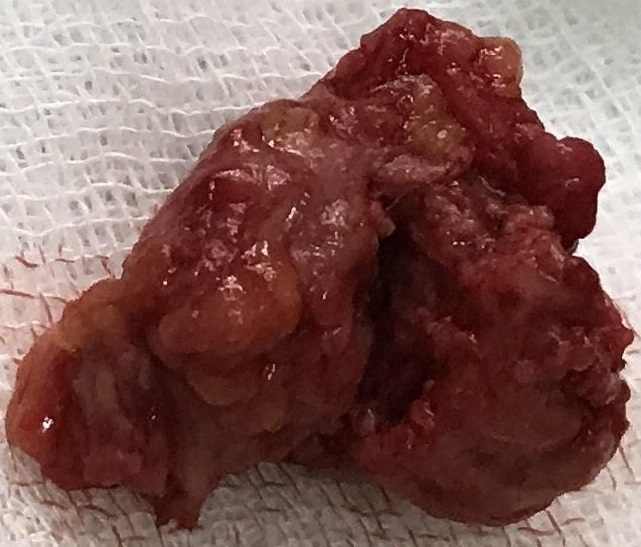 Local wide excision of scar endometriotic tissue with at least 1 cm margin free of the pathology left behind is the treatment of choice for scar endometriosis. This reduces the recurrence rate. Peritoneum is usually not opened in all the cases of scar endometriosis due to discrepancy in its etiology. Oral contraceptives, progestational and androgenic agents have been used in the treatment of scar endometriosis. Hormonal suppression is partially effective and surgical excision of the scar is the definitive treatment. Scar endometriosis is a rare and uncommon diagnosis. One should maintain a high level of suspicion if a woman presents with cyclical pain with a painful swelling at an abdominal incisional site, most commonly after any pelvic surgery. In such instances scar endometriosis should be considered as an important differential diagnosis. Goel P, Sood SS, Dalal A; Romilla. Cesarean scar endometriosis--report of two cases. Indian J Med Sci. 2005;59(11):495-8. Wolf GC, Singh KB. 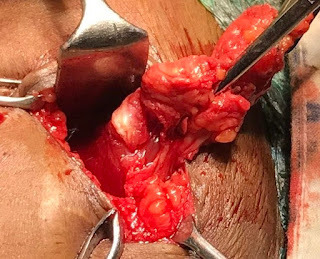 Cesarean scar endometriosis: a review. Obstet Gynecol Surv. 1989;44(2):89-95. K. Al-Jabri. Endometriosis at caesarian section scar. Oman Medical Journal. 2009;24,294-95. Blanco RG, Parithivel VS, Shah AK, Gumbs MA, Schein M, Gerst PH. Abdominal wall endometriomas. Am J Surg. 2003;185(6):596-8. Sunanda N, Asma F. Tubectomy scar endometriosis-a rare case report. International Journal of Contemporary medical research 2016;3(10): 2957-8. Rao LCV, Sumalatha B, Swathi V. Scar endometriosis: A case series and review of literature. Int J Sci Stud 2015;3(4):180-183.